What makes the most sense for growing vegetables (tomatoes/peppers/squash/etc) in a new, small 6ftx9ft greenhouse in a hardiness zone of 6? Planting plants at ground level, simply replacing the first 8 inches or so of soil. Filling the greenhouse base with 8 inches or so of raised soil (not a problem for wood base). Replacing the soil with something like rocks/bricks/mulch and keeping plants in pots. What the the pros/cons of each? It would seem to me that most people go with #3 for some reason. I don't see many people choosing #1, I wonder why... it seems easy and provides lots of surface area to grow in. #2 is a good as #1 but provides extra drainage. 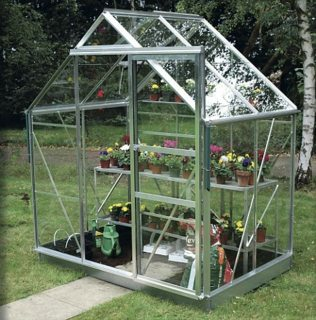 The main reason that people get a greenhouse is to move their location a couple of zones towards the equator to get a head start on getting seedlings to grow, and to allow the growth of plants that one otherwise can't grow. So, pots serve this purpose just fine hence the reason people mainly choose option 3. The problem with using option 1 is that the greenhouse is an artificial environment less exposed to the sterilizing UV from the sun, and so the soil is more easily contaminated and pests can be an issue. Some people get around that by putting their greenhouses on rails/skids so that they rest the soil by moving the whole greenhouse. Not the answer you're looking for? Browse other questions tagged vegetables soil containers greenhouse or ask your own question. 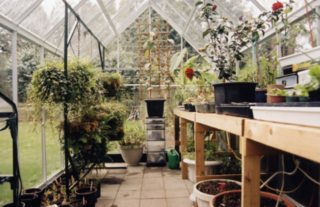 What is the point of a greenhouse? Can I place plants in the ground in the original pots they came from the nursery in? Should perennials purchased at a greenhouse nursery be acclimatized before planting outside?